The Trump administration may impose sanctions against German, and other European companies, that are doing work on the Nord Stream II pipeline project that will bring Russian gas under the Baltic Sea to Germany, at the expense of European energy security and the financial well-being of Ukraine. German Chancellor Angela Merkel is still pushing Nord Stream II to be completed and senior German officials have been quoted inferring the construction project is just an economic contract between two entities and has no security implications. The measure would add yet more tension to the relationship between the United States and Germany, where officials are already fuming over President Donald Trump’s punitive moves on trade, his decision to withdraw from the Iran nuclear deal, and other issues. “They will stop at nothing to block Nord Stream,” one of the sources said, referring to members of the Trump White House, reports Foreign Policy. Officials are still looking at other ways to block to project, known as Nord Stream 2, a natural gas pipeline project meant to bring Russian gas into the heart of Europe. But key figures in the administration now view sanctions as an increasingly likely option, added Foreign Policy. Meanwhile, Russian state-run media is pushing the narrative that American tariffs against its European allies are pushing alliance members into the arms of the Kremlin. Sputnik, the English-language Russian media outlet, ran the headline recently – Stop ‘Russia Bashing’: EU Turns to Russia Amid Tariff Spat with Washington. 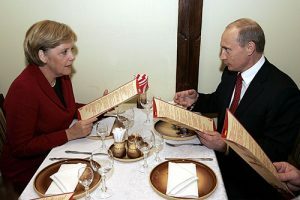 “I do think we have to reconnect with Russia,” European Council head Jean-Claude Juncker said recently. “I am not very happy with the state of our relations. We will never accept what Russia did with Crimea or eastern Ukraine. But nevertheless, we have to have in mind that the entire territory of the European Union is about 5.5 million square kilometers. Russia [is] 70.5 million [sq. km],” he added, reported Sputnik.